MailPoet is a WordPress plugin that allows you to create lists of email addresses and then send emails to those lists. The Easy Digital Downloads MailPoet extension allows the store owner to associate email lists with Downloads so that customers may subscribe during the checkout process. Because MailPoet is another WordPress plugin as opposed to a remote service it's recommended that you install MailPoet first and configure at least one email list. Once MailPoet is installed and configured you may install the EDD MailPoet extension. Then go to Downloads → Settings → Extensions and you'll see the settings area for the EDD MailPoet integration. The first option is to allow customers to sign up for any list at checkout. If this option is not checked then MailPoet will not be available at all in your EDD store. It's essentially an on/off switch for the entire extension. The next option sets a default list to offer to customers. Each product can set its own list, but if no specific list if chosen then this global setting will be used. Each download may be associated with a specific list. 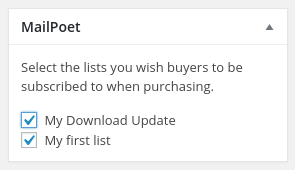 This allows you to have an update list for each product. In the right column of the admin page for a single Download is a metabox that allows the store owner to associate specific lists with that Download. NOTE: The store owner may associate a Download with more than one list, but the customer will still only see the one checkbox with the global label referred to above.